You can save both time and money when you reserve airport parking at Birmingham International Airport (airport code BHX) in advance. There are several Birmingham airport parking lots to choose from. “APH Birmingham” and “Birmingham Airparks” are both off-airport lots, but both provide transfer services to the terminal. There are two on-airport lots, “Birmingham Airport Long Stay 1” and “Birmingham Airport Multi-Storey 3” – the first operates a transfer shuttle, and the second is only a short walk from the terminal. For the ultimate in convenience, there is also the “Meteor Meet & Greet Birmingham” option – you drive right up to the terminal and a driver meets you and drives your car to its parking space. It’s like valet parking at the airport! Birmingham International Airport is about eight miles from downtown Birmingham. This airport is served by a long list of airlines, including many major carriers as well as budget airlines. It is also well-served by a host of charter airlines. 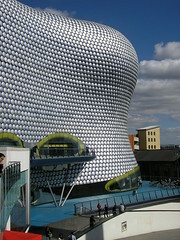 Birmingham’s airport is Britain’s sixth busiest, handling almost nine million passengers every year. A new food court was recently opened at the Birmingham airport. For traffic information, see Traffic England here. Taxi: Black cabs are available outside the airport 24 hours a day, and the fare between downtown Birmingham and the airport is roughly £16. Rail: There is a rail station at Birmingham airport, and it is called “Birmingham International.” The trip from downtown Birmingham takes about 10-20 minutes. From the airport train station, the Air-Rail Link provides free connections to the passenger terminals. Bus/Shuttle: There are buses which connect with the airport from all over the West Midlands; the main service routes are #900 and #966, though even these do not run 24 hours a day.